This tempting assortment of favorite fruits is always a welcome surprise. We fill a handled, wicker basket with the freshest, juiciest fruits of the season, such as apples, bananas, kiwis, pears, grapes, and more. Combined, this colorful assortment is a great gift for thanking, congratulating, or ensuring that loved ones have nourishing foods at hand. Arrives packaged in cellophane and tied with a festive bow. Exact basket and fruit selection may vary by season and delivery location. 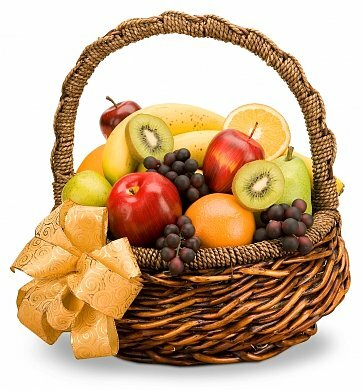 Sweet Sensations Fruit Basket is a hand delivered gift. These gifts are delivered by one of our local design centers located throughout the United States and Canada. Same day delivery is available for most gifts when ordered before the cutoff time. The cutoff time for Sweet Sensations Fruit Basket is 1 PM in the recipient's time zone. Fruit was very fresh and nice presentation. Was impressed that it was delivered the same day. This was a scary delivery. The person receiving is 90 and I wasn't sure with the death of her son if it would be safe to leave on the porch if she wasn't there. The company called first and another person received the order. We recommend this company and this basket for anyone. Thanks, we'll do another order when we need it. The recipient wrote to thank me for the arrangement. Thank you for a timely service. Your service, presentation and final product was EXCELLENT! I sent the fruit basket to a very good friend of mine for her 60th birthday. She said it was so beautiful that it was the talk of her office that day. Thank you for helping me to make her feel extra special and truly blessed on her birthday!! I'm an aussie who ordered from Australia for a sick friend in rehab in Sacramento. He said it truly made his day! Thanks for the wonderful quick service. I sent this basket along with a get well balloon to my father who was recovering in the hospital from a knee replacement. He loved this gift. He said it was a fantastic surprise as the hospital food was not that appetizing and the fruit helped keep things "moving along" despite all of the pain medicines that can throw your tummy out of sync. The fruit was beautiful and not a single blemish was noted. Thank you!